Mayor Martin J. Walsh's office says the exact dates and plans for 'Open Newbury Street' have yet to be set down. However, one Sunday in July, August, and September the mile long road of shops will be closed to traffic. After a successful trial run last year, Walsh's office has decided to make this an annual event, opening the street up to shoppers each summer. 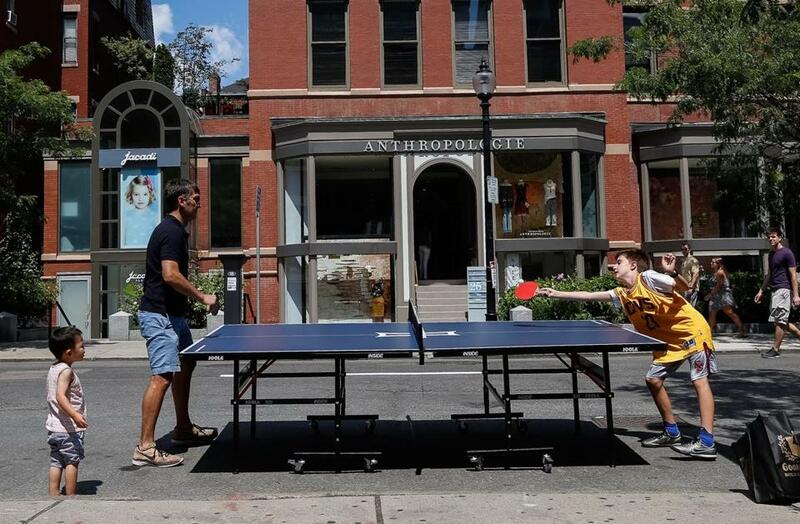 The above photo depicts last year's event, where game tables were brought on to the street to provide pedestrians with some extra summer fun. Businesses and people who participated in last year's event said it turned the street into a walker's paradise. It also gave businesses to expand their patio seating into the street. Many retailers event brought racks of clothes out to put on display. Events like this allow Bostonians a new perspective of their city and unique way to enjoy it. Walsh's office stated that exact dates for 'Open Newbury Street' will be released in the next week. Take back your streets, Boston, enjoy the summer weather.